In early May, the Bureau of Labor Statistics posted data showing the fourth productivity decline in six quarters. In the first quarter of 2016, productivity fell one percent, the worst quarterly decline since 1993. In the whole of 2015, productivity netted only 0.6 percent growth, the smallest increase since 2013. Productivity measures worker output per unit of input, where the inputs are labor and capital and outputs are typically revenues or other GDP-related metrics. Productivity is one of two components that go into GDP, the other one being growth in the workforce. Thus, the only two ways to grow GDP is to grow productivity or grow the working-age workforce. In terms of a growing GDP, productivity is of utmost importance. Productivity has been sluggish since the 2008-2009 recession. The average annual growth rate of productivity from 2007 to 2015 has been 1.2 percent. This remains well below the long-term average rate of 2.1 percent from 1947 to 2015. More disturbing is that productivity has been steadily on the wane since the 1970s, after enjoying decades of impressive growth. The following chart shows the average annual growth rate for the 10 years preceding each bar / year. What’s confounding about that past forty years of rather anemic productivity growth is that it’s concurrent to some of the most transformative technologies we’ve seen in decades. Consider where we were in 1980 when productivity saw a major drop. Computers were beginning to infiltrate offices. Ten years later, a significant number of homes had personal computers. Ten years after that, most everyone had an email address. And then another ten years after that, the smart phone became ubiquitous. All the while, digital technologies opened up new global markets and competition. That computerized systems allowed for more efficiency and productivity in the workplace and global marketplace is undeniable. That it has afforded us much more personal efficiency seemed incontestable, too. Or is it? As technology has transformed global commerce, upended entire industries and disrupted all sorts of sector status quos, economists from all schools of thought are perplexed by meager productivity gains. 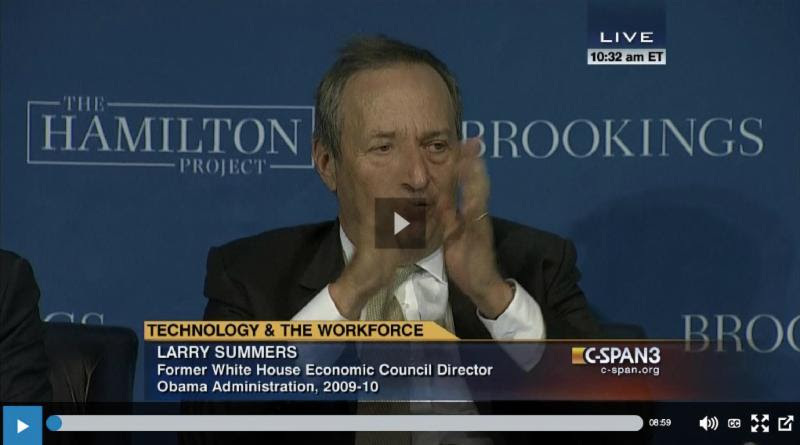 At a Hamilton Project panel in February 2015 about the future of work in the age of rapid mechanical and technical advancements, former Treasury Secretary Larry Summers admitted his ignorance on the topic of stagnant wages and productivity. Summers says he has yet to see the paradox “satisfactorily reconciled” between technology and its undeniably pervasive effects and the “dismal” productivity gains that have coincided it. This is a question that impacts all of us, as we still struggle to restart the post-2008-2009 recession economic engine. But it’s particularly touchy to those in technology – those driving these transformative changes of recent decades. To many in technology, like Bill Gates, productivity is simply an outdated metric that no longer measures relevant factors. Given that so much technology, like apps, is now given away for free, and given that their productivity gains (if any at all) are to the individual, they are indirect to GDP. How could the individual efficiency benefits of, say, Evernote or Slack show up in GDP data? GDP is designed to capture value to businesses, but not to individuals, the “mismeasurement argument” goes. If this is true, then per the argument, the anecdotal productivity gains of the types of technologies currently coming out of Silicon Valley are simply ignored by our traditional economic metrics. Supporters of the mismeasurement hypothesis also say that today’s technologies are deflationary in nature, in that they push costs to consumers down. GDP is not set up to measure the value gains of technologies where prices deflate to a point of accessibility to nearly everybody. An example is GPS, which launched as its own device, like a TomTom, that one had to purchase and then pay a fee to use. Today, we use Google Maps for free, rendering TomTom all but obsolete. What are the individual productivity gains of Google Maps, particularly when measured against its zero dollar price tag? This past February, Chad Syverson, economics professor from the University of Chicago Booth School of Business, published a report that systematically countered all points of the mismeasurement hypothesis and concluded that the productivity slowdown is real. Headlines from his report include that productivity is stagnating in developed economies across the world. Even the countries with smaller tech industries than that of the US still have productivity slowdowns comparable in size to ours, which suggest there is not a lot of unmeasured productivity hiding in tech. And our productivity slowdown is too big in scale relative to the size of our tech industry, suggesting that tech could never plausibly compensate for productivity losses. “The Jetsons” did promise us flying cars. “The Jetsons” also aired at a moment when, thanks to truly futuristic new technologies, many people held jobs that didn’t exist 40 or 50 years prior, like flight attendant and astronaut. But that’s not the case today. Most of us hold jobs that did exist 40 or 50 years ago, and to economist Robert Gordon, this gets at the heart of the problem. In his book, The Rise and Fall of American Growth, Gordon argues that the stunning productivity, GDP growth and wealth creation of the 20th century was the anomaly. It was all made possible by a perfect storm of events unlikely to repeat in our lifetimes or more. To Gordon, the period from 1940 to 1970 was akin to the gambler being dealt three black jacks in a row: the good cards don’t mean bad ones follow, but it’s irrational to expect the stream of 21s to last. Also significant to Gordon are the decades that ushered in these three blackjack hands, which introduced evolutionary improvements in healthcare, sanitation, life expectancy, quality of life, infrastructure, transportation, electrification, home economics, food safety and manufacturing, to name just some. Today, as we fret over how Twitter can become sticky again, we do so amid crumbling infrastructure and generally stalled progress across sectors. 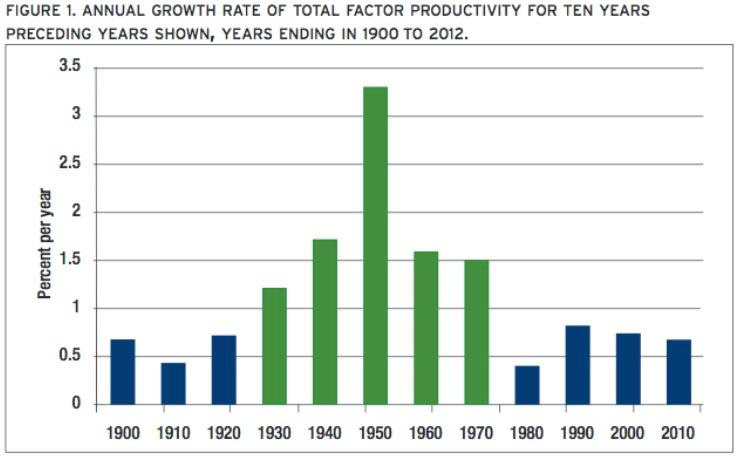 If it is true that our hopes for economic growth are pinned to a bygone era, perhaps it’s time to rethink productivity. What about it can we as individuals control? Is our obsession with chasing and creating more of it even, well, productive? And what of these technologies, like the smart phone, that claim to be improving our lives to the point of productive gains – are they? In this month’s TLV, we’ll consider a few additional inputs into the mystery that is our stagnated productivity, as well as a few ideas to reclaim some personal productivity. Dysfunction: the condition of having poor and unhealthy behaviors and attitudes within a group of people. The state of being unable to function in a normal way. Let me, Doug Leyendecker, go on the record: We have a dysfunctional economy. Given the state of our presidential race, one could also suggest we have dysfunctional politics. Does one beget the other? This past Wednesday, I decided to check out Hopdaddy, a new Houston hot spot, for lunch. The buzz is sizzling about its ode to the hamburger. After standing in line for 45 minutes just to order a burger, my take? Not even close to worth the time. Why are so many people standing in line for 45 minutes for an average-tasting hamburger? Because we have a dysfunctional economy, exacerbating the challenge explored in this month’s TLV – that our productivity is collapsing. Further proof of our dysfunctional behavior are the recent “whispers” overheard at the Federal Reserve…whispers that an interest rate hike might happen this summer. Today the Fed must be distressing over its own inability to project our economic situation. This morning’s jobs report? Total job gains came in at 38,000. “Pro forma” economists will point out that all those striking Verizon workers depressed job growth by 34,000. Okay, let’s call it a gain of 72,000 jobs. That’s not even half of what the consensus predicted for May, which was a 160,000 gain. Needless to say, someone – and a lot of someones – missed something big here. To add insult to injury, 59,000 jobs were reduced from the previous two-month figures. Here’s the job growth pattern: February +233,000; March +186,000; April +123,000; and now May +72,000 (on a “pro forma basis”). Drum roll…and the trend line shows? What’s happening here? We have a dysfunctional economy that’s being supported by a dysfunctional Federal Reserve because we have dysfunctional national economic policy. Has all this dysfunction spilled over into the national psyche, such that something like waiting in line for 45 minutes for a “cool” hamburger somehow seems ok? Does mass economic dysfunction beget social dysfunction? Should some of this time in line perhaps instead be spent…working productively? A rate rise from the Fed has just been pushed out indefinitely once again. And the very hushed whisper from way back in the crowded room of economic pundits may start getting louder. Time for the next version of QE? According to today’s jobs report, “mining” employment (oil and gas) shed another 10,000 jobs in May, taking employment loses in this sector to over 200,000 since its peak in 2014. While the national employment market has shown generally positive momentum for a while, the oil patch forest fire is burning down all manner of jobs. When the drilling rig count goes from 1,900 to 400, as it has over the last 18 months, the industry needs far fewer goods, services and labor. First came job reductions out in the rural areas where fewer drilling rigs were in use. Those field jobs had to be eliminated by folks in the corporate office before companies could start reducing that headcount. This lag effect finally started catching up with the white-collar jobs in Houston and other corporate locales towards the end of 2015. Since then, all kinds of white-collar jobs in oil and gas and oilfield supply and service companies have been eliminated. Bankruptcies, liquidations and reorganizations should continue for some time, likely adding more white-collar folks to the unemployment lines. Once the oil patch forest fire seems close to burning itself out, then we may see a wave of M&A activity spurred on by the desire to further reduce corporate G&A (including jobs) per overall asset value. The oil patch job market will need a lot of “fire fighters” during this period ablaze. After the fire subsides, it will be interesting to see how many, and how quickly, white-collar jobs return. What is likely is that no oil patch jobs will return until oil and gas companies increase capital expenditures. An industry gold rush makes for a wonderful experience. Prosperity spreads widely. Everyone can afford a little more of this, a little more of that. But as we in the oil patch know (once again), one must be careful assuming the good times roll on forever. Leverage seems to cut much deeper on the way down. Maybe it shouldn’t be a surprise that savings rates have slowly risen since the 2008-2009 recession. Experience is what you get when you didn’t get what you expected. Being a saver could be the next cool new fad. 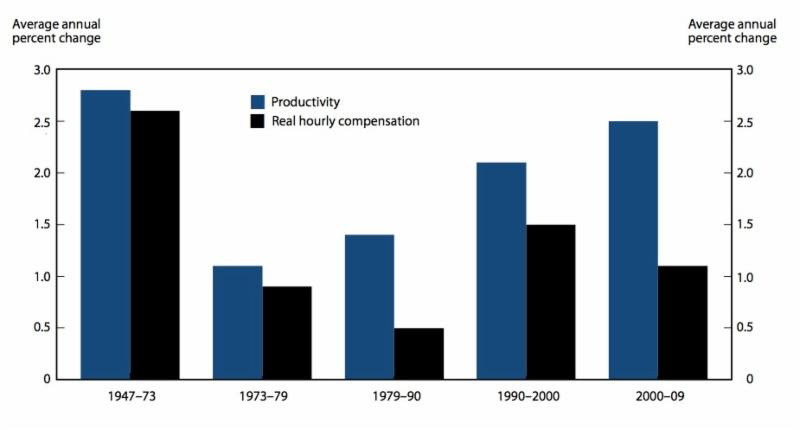 Since the 1970s, growth in inflation-adjusted wages, or real, hourly compensation, has lagged productivity growth. Given that productivity growth itself has often been weak in that time, this is not great news for workers. The following chart shows that even in periods where workers have contributed to better productivity growth, their earning power has not kept pace and continues to fall behind. Economists call this the compensation-productivity gap, which was the subject of a comprehensive BLS report that can be found here. Compensation costs for civilian workers increased 0.6%, seasonally adjusted, for the 3-month period ending in March 2016. Wages and salaries (which make up about 70% of compensation costs) increased 0.7%, and benefits (which make up the remaining 30% of compensation) increased 0.5%. March 2015, the increase was 2.7%. Compensation costs for private industry workers increased 1.8% over the year, lower than the March 2015 increase of 2.8%. Wages and salaries increased 2% for the current 12-month period. In March 2015, the increase was 2.58%. The increase in the cost of benefits was 1.2% for the 12-month period ending in March 2016, significantly lower than March 2015 when the increase was 2.6%. There are those who believe that economic gains from Internet and digital technologies have yet to be realized. The Industrial Revolution yielded untold evolutionary advancements that changed every facet of daily life. Yet pervasive productivity, and thus GDP gains, were not seen until 1940, creating an argument that economic gains lag technological transformations. If this view is correct, then the economic gains of Internet technologies might still await us. Economist Tyler Cowen believes that the value creation of the Internet has only just started. Bill Gates sees recent decades as an explosion of scientific advances, like gene editing, robotic surgery, antibody design, machine learning, AI, driverless cars, etc., that take time to turn into new products, systems and economic benefits. Thus, their economic benefits have yet to materialize. Is the obsessive quest for productivity making us unproductive? All these macro discussions of productivity tend to omit one very important micro factor: the individual worker. What's our role in moving the productivity metric needle? Businessman and author Ray Williams believes our obsession to restore productivity to its glory days is causing us to work to a point of unproductivity. Research shows that productivity declines measurably after working 50 hours per week and without a dedicated weekly rest day. All sorts of data show the average American regularly works far beyond the 40-hour workweek. We are working more and achieving less. In other words, we are burning out and doubling down on productivity declines in our quest to achieve productivity gains. Why is labor productivity so low? Consider investments in skills. In the early days of the IT revolution, learning basic digital skills allowed for a leap in individual productivity and employee edge. This is no longer the case, as most workers today have baseline digital skills, which are now a requirement for most jobs anyhow. Worker productivity will only come with gaining more advanced digital literacy. While there is ample discussion on the importance of businesses investing in IT to stay competitive, there is little dialogue over the importance of investing in worker skills to fully optimize those IT investments. To some, this is low hanging fruit waiting to be captured for productivity gains. Much is written about the technical drags on productivity. But what of those intangibles, like how technology has allowed work to bleed into evenings and weekends? How productive are we when we devote more and more work time to mere communication catch up? What do we then have to give up to get the real work done? What does it mean when nonstop work and technology erode our leisure time, which is a necessary and critical component to optimal productivity? How do we measure those losses and, more importantly, recover them? If Peter Thiel is right in thinking that our productivity problems is in part due to an imagination problem, then we would be wise to consider what does and does not foster our imaginations. When was the last time you had an idea while staring at your inbox? Or smart phone screen? What of the fact that more of our work time is lost to personal communications? What do we lose when we multitask, are constantly distracted by technology and have little time to reflect or, better yet, daydream? A travel writer reflects on something he noticed as a person always on the move for his work: that so much of our lives takes place inside our heads. What is the value of our experiences if we don’t follow them with time to sit still, reflect and turn them into lasting insights? In the age of constant movement and endless digital distractions, what can we shed to create more time to be quiet, go nowhere and let our imaginations be on the move? Using a time-tracking productivity app, a social network company set out to determine the habits of their most productive employees. They found that their greatest producers didn’t work more hours than others, nor did they even work a full eight-hour day. Instead, they took regular breaks, 17 minutes for every 52 minutest of work, in fact. In those 17 minutes, they took a walk, read a book, meditated, chit chatted with coworkers. What was key is that they did nothing work related on these breaks, not even checking email. Since adopting the 40-hour workweek 40 years ago, Sweden has seen a steady climb in sick leave and early retirement, spurring their far left to push for a mandated 35-hour workweek with no pay cut. While opponents state the obvious concerns with such a move, some Swedish companies have opted into an experiment testing the 6-hour workday at legacy salary rates. So far, most participants are seeing reduced absenteeism, more productivity, more revenue and improved morale. While a similar experiment is unlikely to be mandated in the US, the study makes interesting points about how having less time to do the same work motivates people to develop greater focus and avoid mindless distractions. Click the link to view the animated version of the map. 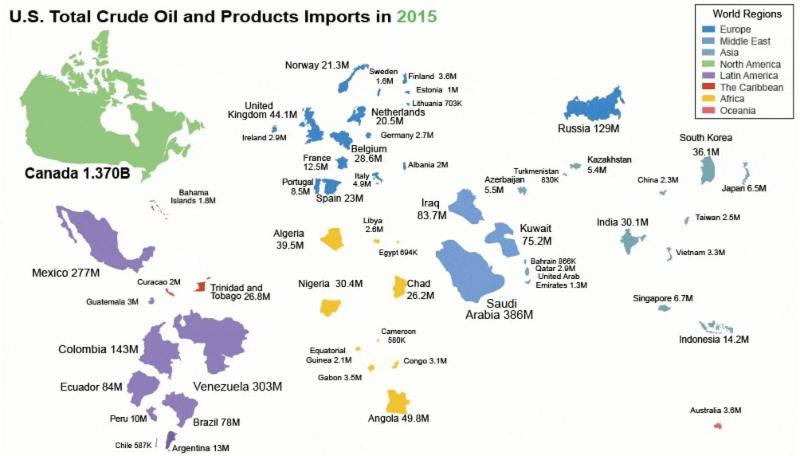 As America has moved closer to energy independence, a significant change in imports from Canada and Saudi Arabia are of note. What are the geopolitical implications if we can continue to wean ourselves off Middle East oil dependence? 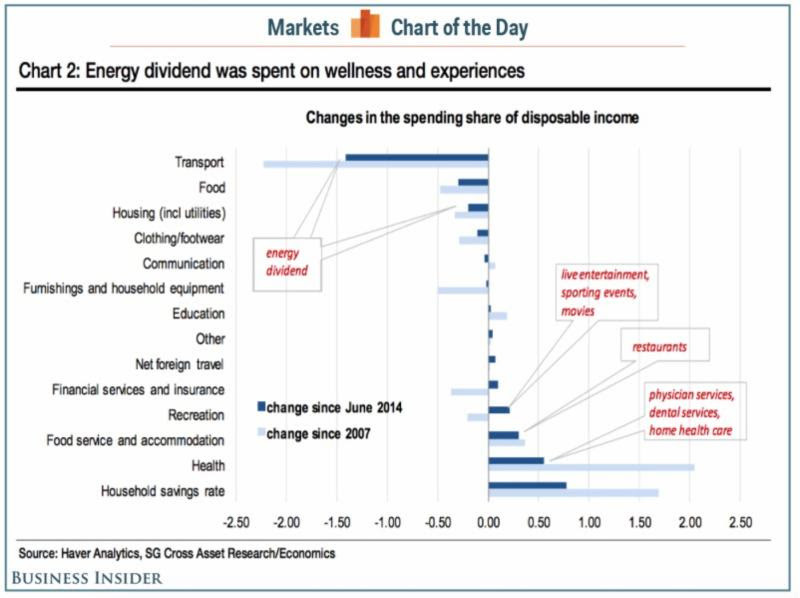 SocGen calculated that the majority of consumer gains from cheaper oil are going into consumer savings accounts. The remaining two-thirds of savings are being spent primarily on healthcare, restaurants and recreation. Traditional retail hasn’t benefited from the oil and gas dividend. Welch cites five traits every productive leader must have. Two of which – the ability to make tough calls and a talent for execution – are functions of self-confidence and thus can and must be practiced and honed. 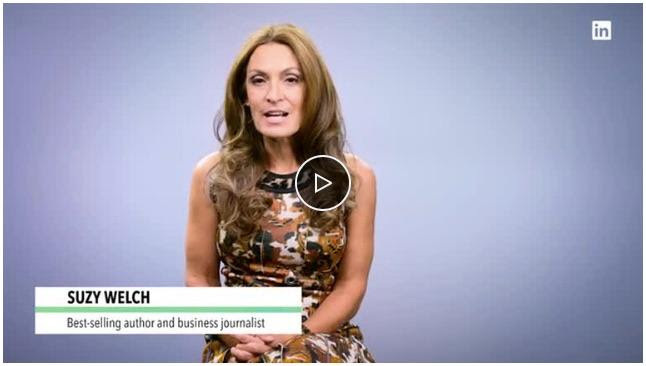 Read on for all five traits or watch Suzy Welch for her take. Instead of panicking when an employee announces he or she has another job offer, HBR outlines a step-by-step plan to help you: buy time to collect your thoughts; get more information; determine if the employee is bluffing to get a raise; calculate if it’s appropriate to make a counteroffer; and figure out how to get them to stay, if that’s what you want. Broad demographic shifts in education, marriage and employment have put more Americans in this age group back in their parents’ homes, a trend unseen in the modern era. Follow the link for Pew’s in-depth report and the forces driving this shift. Are too many Millennials wasting time at work on social media?